This was a nice new wool: Campanica from Portugal. The two wool samples I got were from the same sheep, and quite different in character. That is not unusual, in fact it’s what most sheep produce: different wools from different parts of the body. The site I linked to doesn’t mention other colours than white, but there are black/brown Campanicas also. The smaller skein: coarser wool with kemp. Carded and spun woollen. The bigger skein: softer wool with a small amount of kemp. Hand combed and spun worsted. This was interesting wool to work with. It reminded me a bit of some crossbred wools I’ve spun, like Finn/Texel. Soft with a bounce, and not so little of the bounce either! 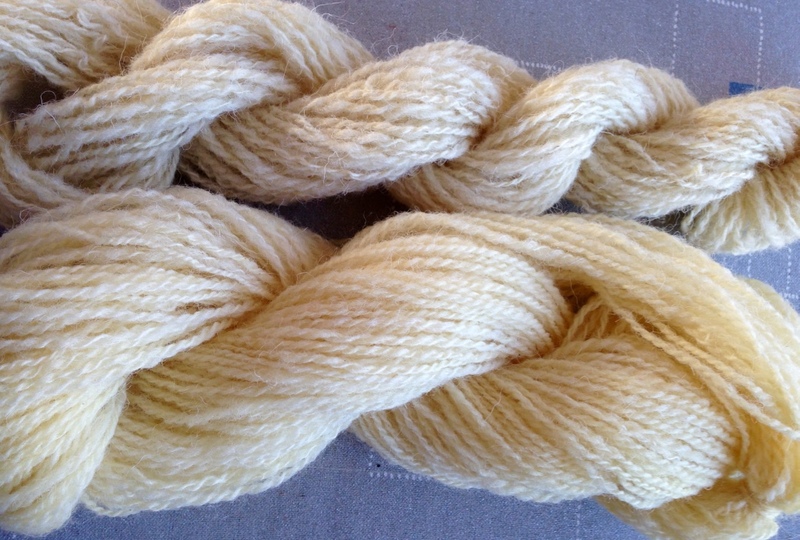 There was yellow stain in the softer wool, which can be seen in the slightly yellow tone in the yarn. It would be a perfect wool for many kinds of sweaters, from rough outdoor to in-between sweaters for winter use, and thinner for summer. Socks, hats, mittens. In Portugal it’s used for blankets and rugs, mixed with other wools. The coarser yarn I would use just like that, in a blanket, bag, or carpet. I just learned that there is a number of people trying to preserve the traditional Portuguese ways to prepare and spin wool. They have a group on fb called Cooperativa Oficina de Tecelagem de Mértola. Use the fb translator to see what they’re doing. How nice to get your hands and tools on different wool. I loved working with my Herdwick and am working on a Ryeland at the moment, outside in our one day of SUN!! thank you.